Non-communicable diseases (NCDs) are those that are not infectious, progress slowly and last longer. Rapid urbanisation and ageing populations have exacerbated the rise of NCDs in the 21st century. The contributing risk factors are generally related to an individual’s lifestyle, which include an unhealthy diet, physical inactivity and tobacco and alcohol intake. However, environmental factors such as chronic exposure to chemicals and pollution also play a role. These may include exposure to metals, pesticides, dyes, persistent organic pollutants, pharmaceuticals, chlorinated solvents and drinking water disinfectants. The need to address environmental factors to prevent the rise of NCDs is being increasingly recognised. Antibiotics, for example, are one of the most commonly prescribed and used drugs to treat infections. Their use has been linked to NCDs through both cause and effect relationship. Antibiotic consumption in childhood can be a causal factor behind obesity in adulthood, which, in turn, may lead to NCDs. At the same time, some NCDs, such as diabetes, are associated with bacterial infections which call for greater antibiotic therapy, leading to higher drug resistance. Antibiotics are commonly given to infants and mothers to prevent neonatal and maternal infections. People also often resort to self-medication and use antibiotics to address infections. Children administered with broad spectrum antibiotics before the age of two were found to have an increased risk of obesity in adolescence and adulthood, says a study published in Gastroenterology in 2016. A study by the Johns Hopkins Bloomberg School of Public Health, and published in the International Journal of Obesity in 2016, found that antibiotic use in childhood contributes to weight gain that accelerates with age. That antibiotics can impact the weight of humans also draws from the fact that they are widely used as growth promoters in intensive animal production systems such as poultry. 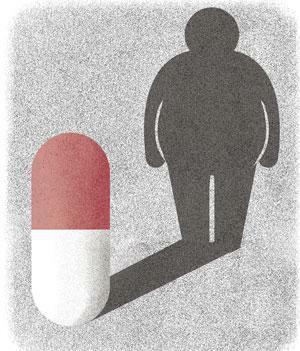 Antibiotic use has also been linked to diabetes. A research study in the UK, published in the European Journal of Endocrinology in 2015, traced the number of antibiotic prescriptions given to over 0.2 million patients affected with type 1 and 2 diabetes, and found that nearly half of the patients were prescribed antibiotics at some point during the study period (1995-2013). Also, the risk of type 2 diabetes increased with the repeated use of antibiotics. Interestingly, no association between the risk of diabetes and antiviral or antifungal medicines was found, which indicates specific involvement of gut bacteria in triggering diabetes. A nationwide study in Denmark, published in The Journal of Clinical Endocrinology and Metabolism in 2015, found that the more a person is exposed to antibiotics, the higher are his/her chances of getting type 2 diabetes. The human gut is populated by a dense community of both beneficial and harmful bacteria, which are associated with the metabolic processes in the body. Antibiotic consumption influences the gut microbial ecology, causing chronic health issues through hormonal, inflammatory and metabolic changes. Several mechanisms have been proposed to explain the influence of antibiotics on the gut microbiome and their role in contributing to NCDs. An increase in Firmicutes and a reduction of Bacteroidetes, two of the largest bacterial phylum in humans, have been often observed in obese individuals as compared to lean ones, and referred widely to explain antibiotic-induced obesity. Firmicutes helps the body to extract calories from complex sugars and store them as fat. Antibiotics can also cause alterations in the host metabolism, including upregulation of genes and expression of proteins involved in lipogenesis, a metabolic process related to the formation of fat. Antibiotics can also impact the hormonal balance in the body. For instance, antibiotics used to treat H pylori infections can cause an increase in ghrelin (hunger hormone) and leptin (satiety hormone) levels, which can, in turn, lead to increased appetite and body mass index. Antibiotics also possibly impact gut microbiota to influence the production of short chain fatty acids, lipoprotein, bile acid metabolism, insulin resistance and chronic low grade inflammation, all of which are associated with increase in body weight. But not all experts agree with the hypothesis that a high ratio of Firmicutes/Bacteroidetes in the gut is responsible for obesity. According to a study published in the Journal of Biosciences in 2012, molecular analysis of the gut microbiota in obese Indian individuals showed that Bacteroidetes dominated the gut microbiome of surgically treated and non-treated obese individuals. While alterations in the characteristics of gut microbial community may explain the relationship between antibiotic use and obesity or diabetes, infections have also been identified as causative factors for NCDs. For instance, episodes of Streptococcus infection and gastrointestinal infections are known to be followed by acute rheumatic fever and arthritis, respectively. Antibiotics are often held accountable because they are an indicator of an underlying infection. Several NCDs, such as cancer and diabetes, are accompanied by increased susceptibility to infections, which are treated with antibiotics. There has also been a rise of bugs resistant to antibiotics prescribed to treat such infections. Treatment of cancer, for example, is typically associated with surgery, radiation therapy, chemotherapy and bone marrow transplants, which leave patients with a weaker immune system. Bacterial infections, such as bloodstream infection (BSI), urinary tract infection (UTI) and surgical site infection are quite common in such patients. Analysis of some recent Indian studies on bacteria isolated from cancer patients suffering from BSI, UTI or post-operative infections, indicates the prevalence of resistant Gram-negative bacteria namely E coli, P aeruginosa and Klebsiella spp and Acinetobacter spp. Resistant Gram-positive S aureus and Enterococcus spp have also been isolated. These bacteria were resistant against a wide variety of antibiotics, some of which are critically important and used as “last-resort” antibiotic in hospitals. These include fluoroquinolones, third generation cephalosporins, erythromycin, ciprofloxacin, ceftazidime, piperacillin tazobactum, meropenem and amikacin. To avoid infections, antibiotics are sometimes prescribed to cancer patients pre-emptively. This also generates greater selection pressure among bacteria and increases the possibility of resistant strains being harboured in the gut microbial community. Diabetes patients, characterised by high blood sugar levels, also have weak immunity and are prone to infections. Diabetic foot infections (DFIs), UTIs, skin infections and post-surgical infections are co-morbidities observed commonly among diabetics. Owing to continuous antibiotic exposure, bacteria associated with such infections, therefore, exhibit widespread drug resistance. A bacterial profiling of antimicrobial drug resistance in diabetic foot ulcers in patients at a tertiary care hospital in Maharashtra revealed multi-drug resistance among Gram-negative E coli, P aeruginosa, Acinetobacter spp, Klebsiella spp, Proteus spp, Citrobacter spp and Gram-positive methicillin-resistant S aureus. The study was published in the International Journal of Medical Research and Review in 2015. Antimicrobial resistance (antibiotic resistance, or ABR, in particular) arises when bacteria are able to survive exposure to an antibiotic. Emergence of resistance in bacteria is a natural process, but it accelerates and spreads by antibiotic misuse and overuse. 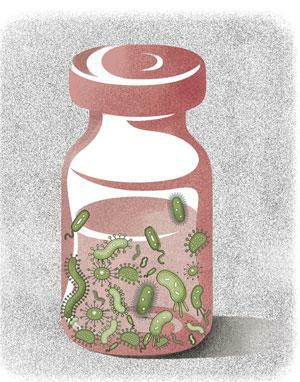 Antibiotic use exerts greater selection pressure on bacterial populations making them resistant. At the cellular level, resistance is acquired through mutations in bacteria or transfer of genetic material to another bacterium through horizontal transfer. Subsequently, the bacteria undergo structural and chemical alterations that render the antibiotic ineffective. Resistant bacteria can develop and spread to humans through three main routes—human antibiotic consumption, food, and environment (see ‘How people are exposed to antibiotics and antibiotic-resistant bacteria’). Antibiotics used in animal farming favours the emergence of resistant bacteria in animals, which can also be transferred to humans through the consumption of meat and food with resistant bacteria, direct contact with live animals, carcasses at farms and slaughterhouses, environmental contamination of soil and water through animal excreta, pharmaceutical manufacturing and domestic effluents. 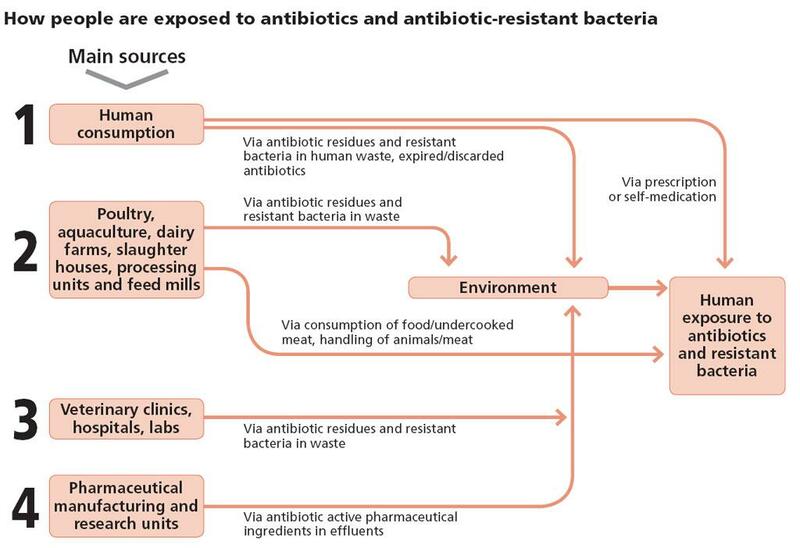 Antibiotic residues entering into humans through food consumption or through environment may also cause selection pressure in bacteria present in humans and lead to generation of resistance. The tropical climate of India provides suitable conditions for the proliferation of bacterial diseases. This, along with largely unsanitary conditions, limited infection prevention and control, poor environmental policies and practice and inadequate health systems are the reasons for the high prevalence of infectious diseases. Antibiotic use is, therefore, constantly growing. An estimate on global antibiotic consumption, published in The Lancet in 2014, states that India was the largest consumer of antibiotics from 2000 to 2010. The NCD burden in India is also concomitantly rising. The country has the second-highest number of adults with diabetes (after China), and obesity in men has doubled over the last decade. NCDs have accounted for 60 per cent of the deaths in the country in 2012, states the World Health Organization’s Global Status Report on Non Communicable Diseases 2014 . Therefore, for India, the public health impact owing to the high prevalence of infectious diseases as well as NCDs is enormously high as compared to western countries where the burden of infectious diseases is much lower, despite NCDs being a grave concern. The National Health Policy, 2017, recognises the need for addressing NCDs, communicable diseases as well as antimicrobial resistance or AMR (AMR includes antifungal, antiviral and antibiotic resistance). Our health systems, infrastructure and policies should, therefore, work to reduce the burden of NCDs as well as infectious diseases. This will not only bring down antibiotic consumption, but also contain AMR spread. At the same time, controlling environmental factors, such as chemical exposure, should be made a part of India’s plan to reduce NCDs. While the contribution of diet and lifestyle to obesity and diabetes are well-studied, the role of antibiotics on gut microbiome and its implications leading to NCDs have only recently been explored. In addition to the increased threat of antibiotic resistance, understanding the underlying mechanisms that explain the metabolic relationship between antibiotic consumption, drug resistance and NCDs is an emerging area of science. This calls for the creation of newer research agendas. This will not only lead to newer insights into the functioning of the microbial community, but also help create new treatment algorithms to tackle antibiotic resistance and NCDs and provide opportunities to tailor interventions to combat obesity. Given the limited discovery of new antibiotics over the last few decades, it is necessary to preserve the existing ones and create sufficient public and consumer awareness on the proper and rational use of antibiotics. The National Action Plan on AMR, released in 2017, emphasises the need for antimicrobial stewardship in human health along with necessary education, training and communication. Infectious diseases and NCDs are not completely independent of each other. Physicians associated with the treatment of NCDs share an equal responsibility to combat the spread of ABR. Infection prevention and antimicrobial stewardship approaches must be followed. Rapid and accurate diagnosis is also essential to reduce possibilities of infection and allow the use of the most effective antibiotics. But most importantly, antibiotics should be judiciously prescribed and consumed. 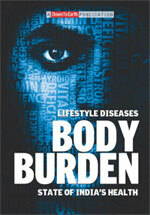 which delves deep into the State of India's Health.